This product is new. It has never been out of the box. These retail for $1,210.00. We purchased several at a discount and can pass on the savings to our clients. 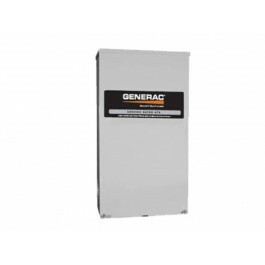 Generac Nexus Smart Switch 200 Amp Automatic Transfer Switch (ATS) w/Service Disconnect 120/240 Single Phase NEMA 3R Cabinet with Digital Load Management Technology. Generac Nexus Smart Switches are designed to operate with the Nexus controller used on air-cooled and liquid-cooled QT series. The Smart Switch will operate only with the Nexus or Generac R200 controller. Efficiently manages two large loads without additional components. • Standard load management of two air conditioners. • Cover more circuits with a smaller generator. • Add additional individual DLM modules and manage up to four more large loads. • Nema 3R aluminum enclosure. 1. By monitoring generator engine performance, the switch is able to identify when the generator approaches overload. At the appropriate time, the switch disconnects two air conditioners, typically the highest electrical load in the house. 2. After a 5-minute delay to allow for compressor bleed out, the switch brings the AC units back online one after the other with a 30-second delay in between. This is a standard capability in all Generac Smart Switches and does not require any additional components, unlike competitive transfer switches. 3. In addition, up to four other large 240V loads can be managed when the Smart Switch is used in conjunction with individual DLM modules. • DLM modules are 50 Amps each and are housed in a NEMA 3R enclosure, giving the installer the option to install them either at the electrical panel or anywhere in-line indoors or outdoors between the electrical panel and the appliance. • After the four loads are shed, they are brought back individually to assure DLM Module generator capability and eliminate the potential of overload.